NEXT | The Queue: Are you squidding me?! This year’s Anniversary event in World of Warcraft introduced a “new” twist to the event with the return of several old world raid bosses. You can use Timewarped Badges obtained from the holiday — or from previous Timewalking events — to purchase goodies both new and old. And in a first for the annual holiday, players have the option of purchasing a sweet pair of Bronze-Tinted Sunglasses. The Sunglasses are a cosmetic item with no armor classification, to be used for transmog. Unfortunately for fans of the shades, it appears you can only use the item during the Anniversary holiday. Players are understandably upset about this revelation. There’s nothing about the shades that screams “holiday item,” nor are the sunglasses clearly labeled as such. The Timewarped Badge currency used to purchase the item is available year-round, albeit staggered via Timewalking holidays. It can be used for a variety of different rewards — none of which are tied to a particular holiday. Frankly, had I known the shades were only able to be used for transmog during a limited window, I probably would have saved my 200 Badges for something that actually had value. But honestly, this is all part of a larger problem I’ve had with transmog. Items are arbitrarily limited or outright exempt from transmog status — and there’s no real reason for it. Customization is one of those perks we have precious little options for. Part of the reason transmog is so wildly successful is that we’ve finally gotten the freedom to make our characters look a little different. If someone wants to run around wielding a fish and wearing an apron, why is that so silly? 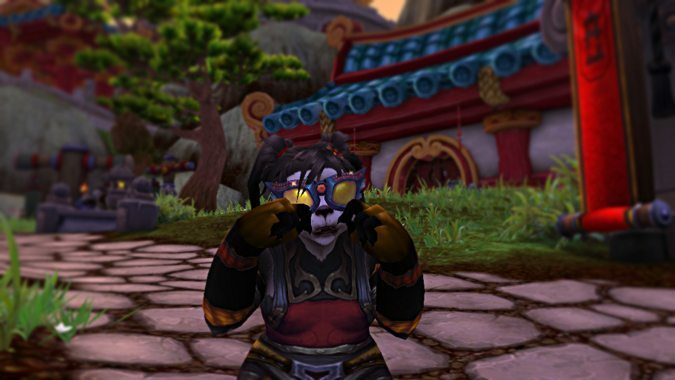 Let’s face it — World of Warcraft is chock full of incredibly silly things. In the long run, rocking a stylish pair of shades or an ugly Christmas sweater year-round isn’t going to ruin anyone’s gameplay. While this may just be an attempt to keep holiday items “special,” it’s had the opposite affect for many players. Limiting an item’s use — no matter how sensible the decision may seem — is still limiting. And for players who have been yearning for more ways to look a little different, no amount of sensibility is going to make a limiting decision seem like anything other than an arbitrary choice to keep them looking the same. If nothing else, let’s hope Blizzard finds a way to more clearly note these holiday items as holiday-only — that way, players can determine if they really want to obtain them, or if it’s better to simply focus their efforts elsewhere.